MJ data bank: How did you happen to work on the Thriller Short Film ? Douglas Kirkland: I was assigned by LIFE Magazine to photograph on the film and spent 3 days working at the studio and some Los Angeles locations. MJ data bank: What was your approach during those sessions: what did you want to capture and show ? Douglas Kirkland: Part of my work was in a photojournalistic manner recording the process of making the video especially make up which took very long periods as well as carefully watching every move on the set. I worked in two ways: in addition to the set work I set up pictures with Michael and other participants. MJ data bank: Michael Jackson in motion: how hard was it to capture his dance moves on the set ? Douglas Kirkland: I found no difficulty photographing him dancing because the moves were very dramatic and helped automatically create strong images. I also used some long lenses ie a 300 mm and 180 mm and made head shots as he was waiting between takes. (…) The image that was used on several releases like the Thriller 12″ Single and The Essential Michael Jackson CD as well as the Time Magazine cover by Andy Warhol which was an interpretation of one of my images were the product of the long lens technique I mentioned. Most of he shooting was either done at night or inside a soundstage that was darkened. MJ data bank: Many observers agree on the fact that Michael Jackson’s moves, style and gestures have become iconic. Do you agree with that ? Douglas Kirkland: I think he was at his best at the time of Thriller and I very much enjoyed working with him and the people around him. 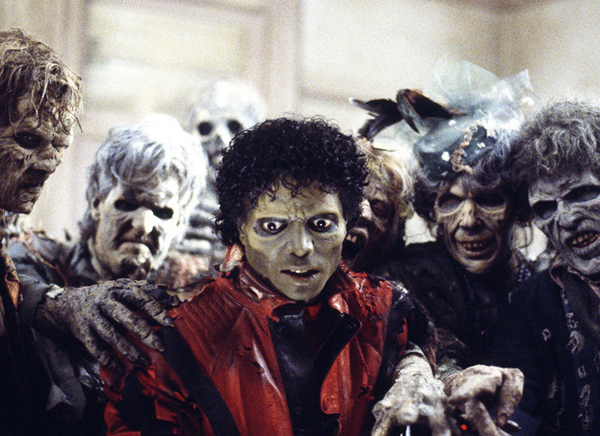 Iconic image throughout the years: Michael Jackson – Thriller !